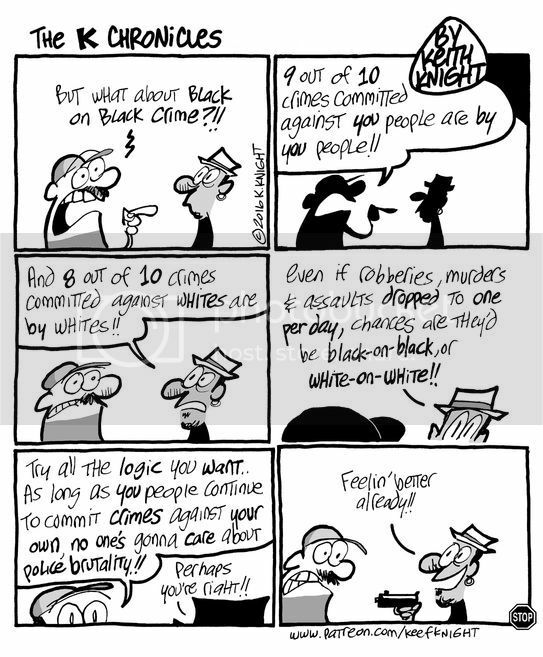 The Shocking Truth of Black on Black Crime! A favorite of racists avoiding conversations about police brutality. [+3] - bobsal u1553115 - 09/28/2016I thought I deleted this. I cannot for the life of me resize anything. I apologize to everyone except he who shall not be named. I have to get back to the moderator's secret page. oooops. Here it is. You can ask the moderator to substitute my link for yours in your first post, in which case if they do, they can just delete this post, it will be unnecessary. Why is this nonsense being "featured", while several other excellent threads are never featured? Do I smell the stink of discrimination? It is more than apparent as Bobsal is allowed to spam this site on a continuous daily basis, have posts that disagree with him immediately remove from a thread, call people names, and does so with impunity, he is either a moderator or he is in cahoots with one. It goes to show that the site is controlled by the far left in an effort to further they're liberal progressive narrative. If Bobsal was a moderator, don't you think he would know how to post a cartoon in normal size so it could be read? Heck, I already gave permission to the mods to substitute my link which works for his which does not post a readable picture. Nothing happened. Oh well, this is the era of conspiracy theories. I thought I deleted this. I cannot for the life of me resize anything. I apologize to everyone except he who shall not be named. I have to get back to the moderator's secret page. » The Shocking Truth of Black on Black Crime!